There are three main methods that professionals typically employ to rid an establishment of a termite infestation. From localized spot treatments to general fumigation and heat, each treatment option has a different set of preferred uses. Let’s look at these various treatment options and the unique features and applications of each. Pre-treatment is an incredibly successful way to take preventative measures against termite infestations. Pre-treatment is a cheap and effective way to “seal” off a structure from opportunistic termites. Pre-treatment applies termiticide to the soil around a building’s foundation and seals it in after the foundation is placed. This treatment helps prevent termites from infesting areas of a structure that might be otherwise inaccessible after the building of the structure is complete — not to mention an area that, if damaged, could threaten the structural stability of the home. Spot treatment is often applied in the form of liquid termiticides as a barrier treatment. This barrier treatment can help control infestations and prevent termites from breaching a structure and taking hold. Spot treatments also kill the termites that do manage to penetrate a treated area. There are two general types of spot treatment termiticides on the market. The first type repels termites and keeps them at bay, while the second type allows termites to contact the poisonous chemical and inadvertently bring it back to their colony. This transport of termiticide has the benefit of killing their entire population, and can effectively keep the area termite-free for many years to come. When compared to other forms of control such as fumigation, spot treatment can be considered fairly inexpensive. Alternately, repellants are prone to developing gaps in protection, and liquid termiticides can contaminate water in structures close to waterways or wetlands. Most everyone is familiar with the circus-like tenting that may pop up from time to time throughout residential neighborhoods as a result of a termite infestation. 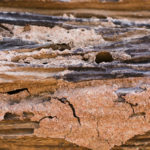 Termites can make quick work of structural wood, and once an infestation is identified, it is imperative to act quickly. The benefit of whole-house fumigation is that it ensures all termites within the sealed boundaries of the structure are eliminated completely. To apply fumigation, the structure is covered in a nylon tent and sealed, and then the home is flooded with a colorless, odorless poisonous gas. At the end of fumigation, the building is aired out and the air is tested for safety prior to reoccupation. When using this type of treatment, it’s important that the professionals contracted to complete fumigation are careful to manage heat sources appropriately. Temperatures that are too high can turn the fumigating substance into a corrosive acid that can further damage the home. Keep in mind that much like heat treatment, fumigation cannot prevent future infestations. This is why pre-treatment and spot treatment are an important part of any long-term termite control plan. For those looking for a pesticide-free option, heat treatment can be applied in lieu of spot treatment or fumigation. Heat treatment is an environmentally friendly alternative to these more conventional methods. A heat treatment penetrates structural wood and offers a quick turnaround time—often being completed in less than 24 hours. Two drawbacks of heat treatment are that heat-susceptible items in the home may be damaged, and that this treatment does not protect against future infestations. But with the right application and a plan for prevention, this can be a great alternative for the environmentally conscientious individual. Fortunately, termites provide us with many signs and symptoms of their occupation. First and foremost, winged termites are a surefire signal that these pesky parasites have taken up residence. 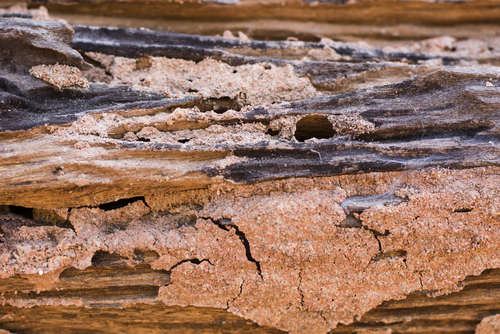 Termite colonies often flourish in basements, on porches and decks, and near windows. Keep an eye out for piles of pellets and discarded wings, severely damaged wood that sounds hollow, and pin-sized holes in wooden structures and walls. It’s important to be able to rely on your pest control professionals when contracting any termite control services. Adios Pest Control stands by its services, offering a four-year warranty on all fumigation services. This warranty provides you with a promise of effective treatment and the professionalism necessary to help you keep your home or structure termite-free. Need help ridding your home of termites? Get in touch with Adios Pest Control today.